Hello Savvy readers! 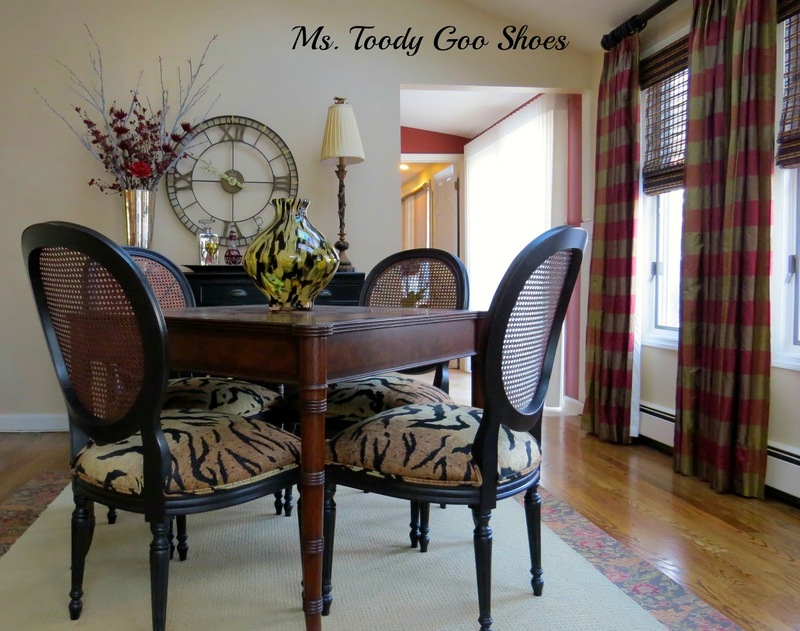 I'm Amy, also known as Ms. Toody Goo Shoes. 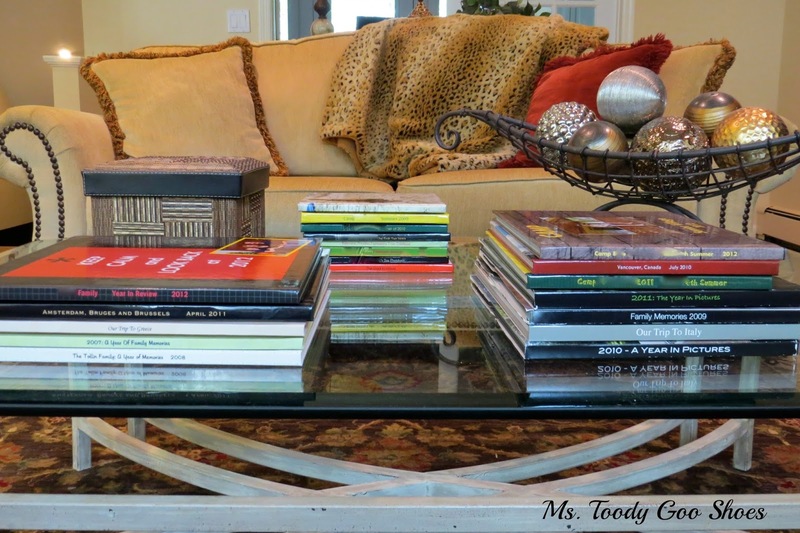 I've been doing cartwheels ever since Kim asked me to feature my favorite room on her blog! 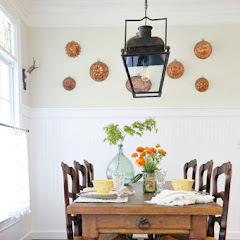 Savvy Southern Style is one of the very first blogs I started to follow, and I've been smitten with Kim's impeccable design sense ever since. It didn't take me long to decide which room to feature today. 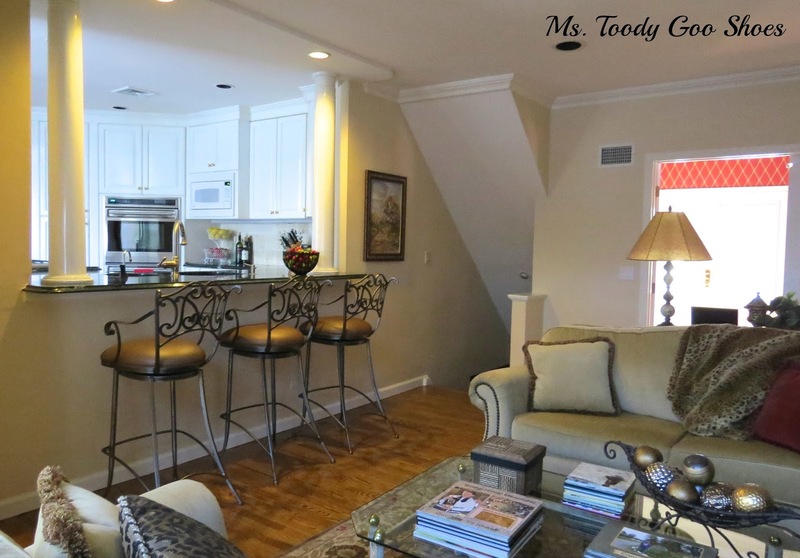 Without question, it had to be the Family Room! It's our TV-watching, family-meeting, game-playing, football-cheering, company's-coming, ring-in-the-new year, put-your-feet-up-and-relax room. Now, to be honest, in these photos, the room doesn't look as, ahem, "lived in" as it usually does. In fact, when my son came home from school the day I was taking the pictures, he said, "Where did everything go? Are we MOVING?" I told him not to worry -- I'd mess it up again as soon as I was done taking pictures. True story. ...which, by the way, seems to change every 10 minutes...or, pretty much every time I look at someone else's favorite room. Although many types of decor appeal to me, my home is furnished in the traditional style. My goal for this room was to give it a modern traditional feel. 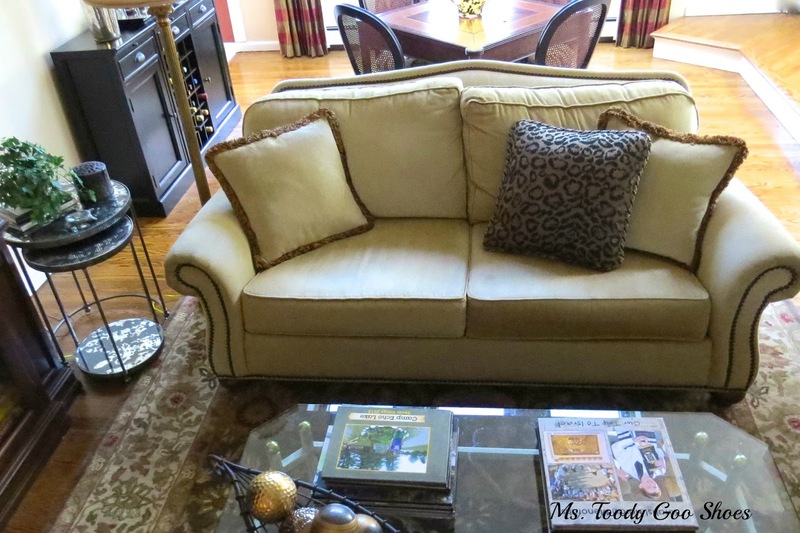 The Family Room got a makeover about four years ago. Here's the way it looked before we updated it. ...and the game table/bar area. There is only one full wall in this room, which made it a no-brainer as for where to put the TV. There weren't a lot of options for seating, so we decided on two love seats facing each other. 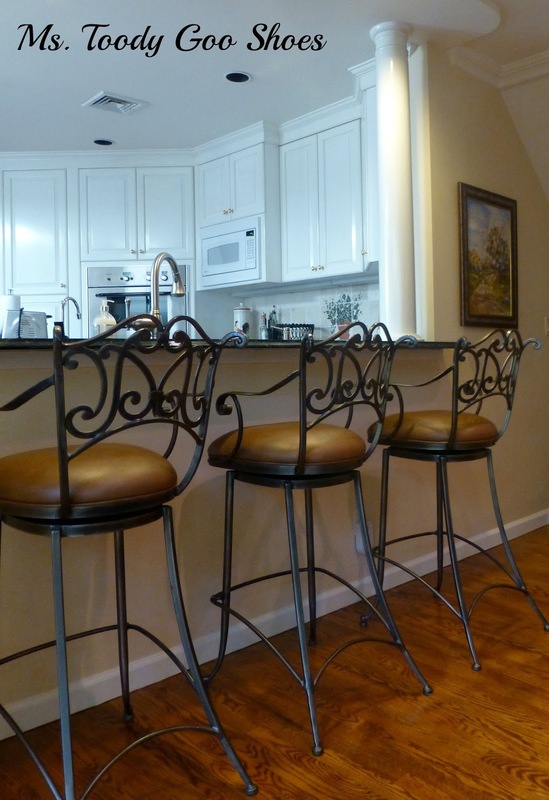 That left us ample room for a passageway, and bar stools at the kitchen's pass-through area. Other than painting and refinishing the floors, we haven't done any major renovations to this room. The columns were here from the original owners, and I think that their presence makes the whole area look a lot more grand. 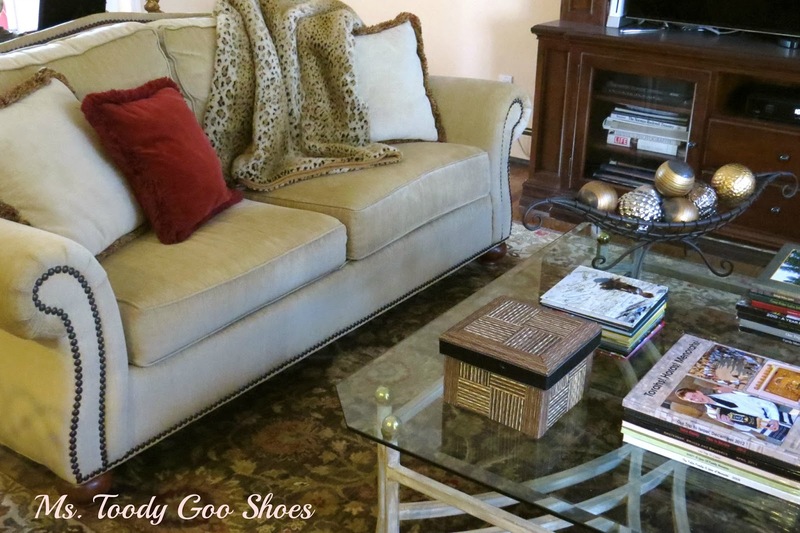 We replaced every piece of furniture in this room, except for the coffee table, thinking it was temporary until we found something else, but I actually like how the glass table helps to keep the space feeling a little lighter. The beige metal base is a good compliment to the wood, and although the glass top is pretty scratched up, I have no plans to replace it. The top is always covered with my photo-books, which I make for any and every occasion. 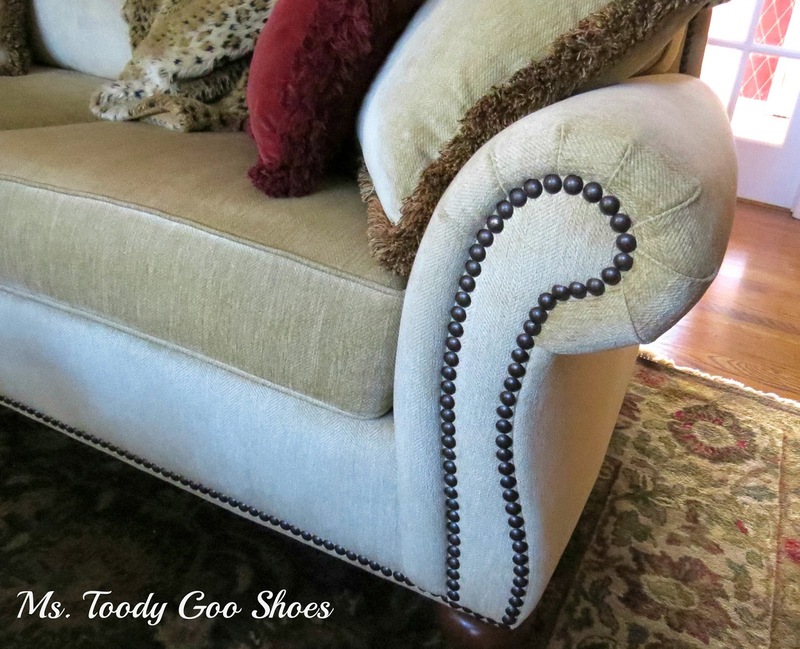 The simple couches are taken up a notch with the addition of the nail heads, and are covered in a durable chenille. Yes, we have even spilled orange children's Motrin on one of them, and it came right out. On the other side of the room, we have our game table, which is often the scene of some very heated Monopoly games, most of which, sadly, I lose. Put a table cloth on it, and the game table becomes extra seating when entertaining. Between the media unit, sofa table and game table, there was already a fair amount of brown wood furniture in the room, so we brought in some black painted pieces to balance it out. I chose a distressed black finish for the game table chairs. My absolute favorite thing is the animal print on the seat covers. 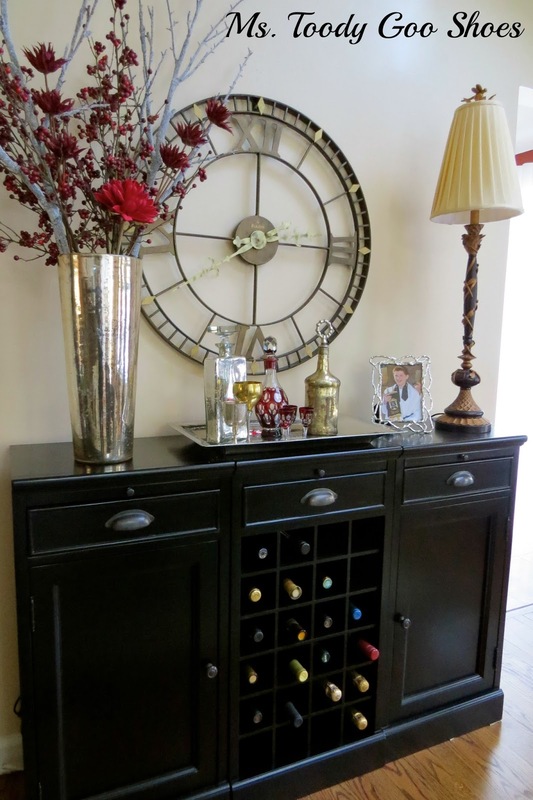 The bar was purchased from Pottery Barn, and ties together nicely with the black chair frames. 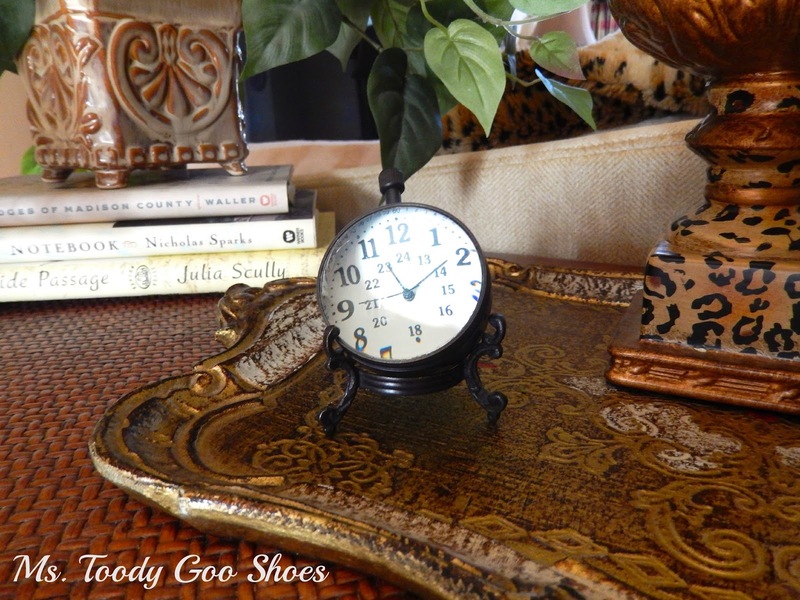 I love mixing inexpensive items with treasures. 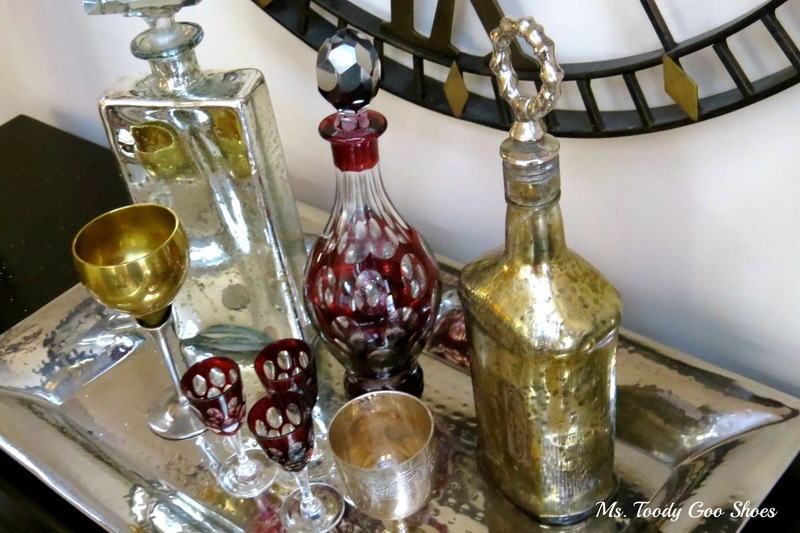 The silver tray and mercury glass decanters are from Home Goods; the burgundy glass decanter and glasses were a gift to my parents for their wedding; the brass goblet was used at our wedding when we shared a traditional sip of wine; the silver goblet was a given to me when I was a teenager. 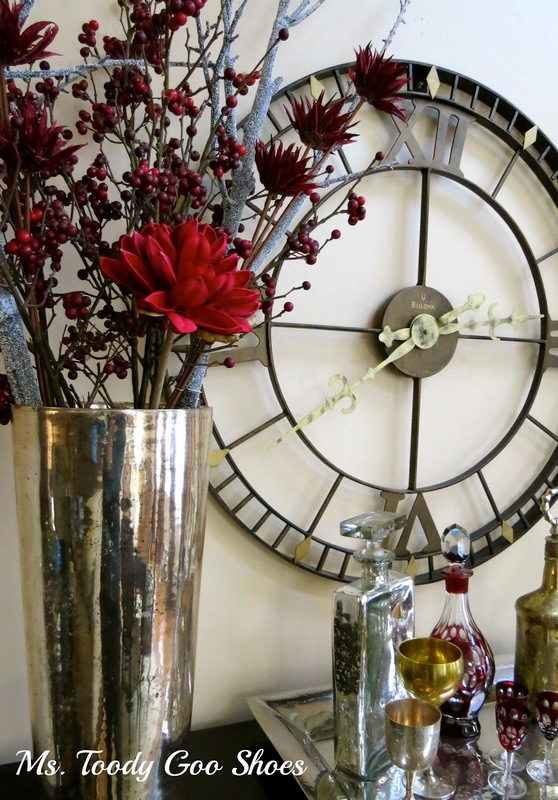 The tall vase is from Home Goods, and is changed out seasonally. Right now, it is holding my winter stems and berries. I am still working on adding more accessories to this room. Maybe Kim would like to come over and help me? 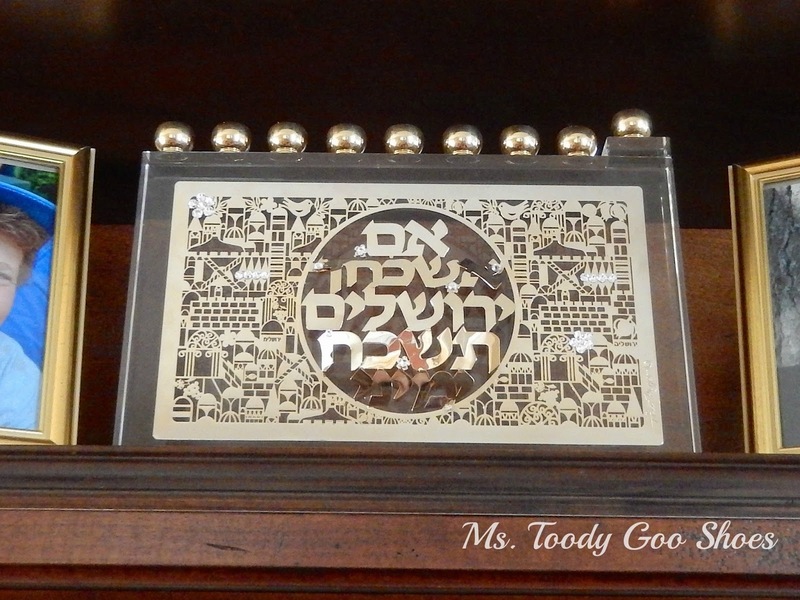 The menorah is a truly special memento from our trip to Israel last year. 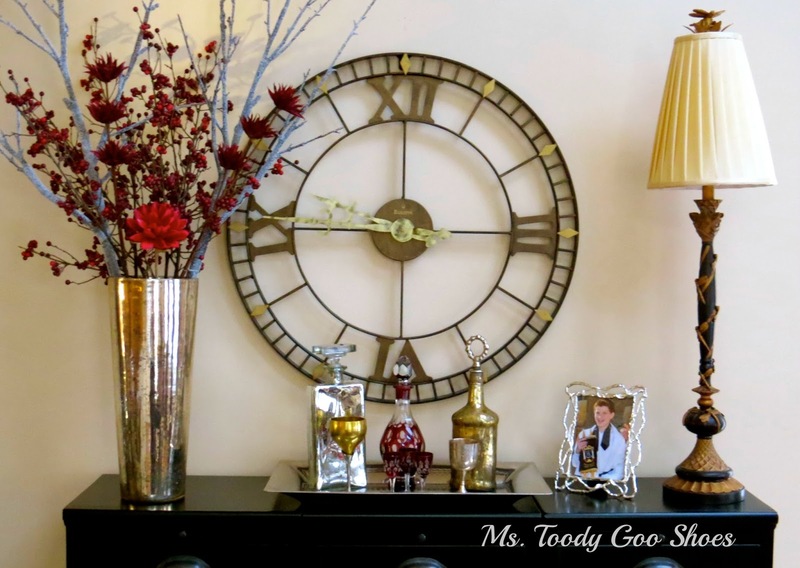 The little clock and animal print urn are local finds; the tray they are sitting on is from our trip to Amsterdam. The silver lighter was another gift given to my parents for their wedding. Well, I had a great time showing you around my Family Room. Now I need to go and mess things up again, so my son can stop worrying that we're moving. Thank you so much for inviting me, Kim! Thanks Amy for letting us tour your favorite room. 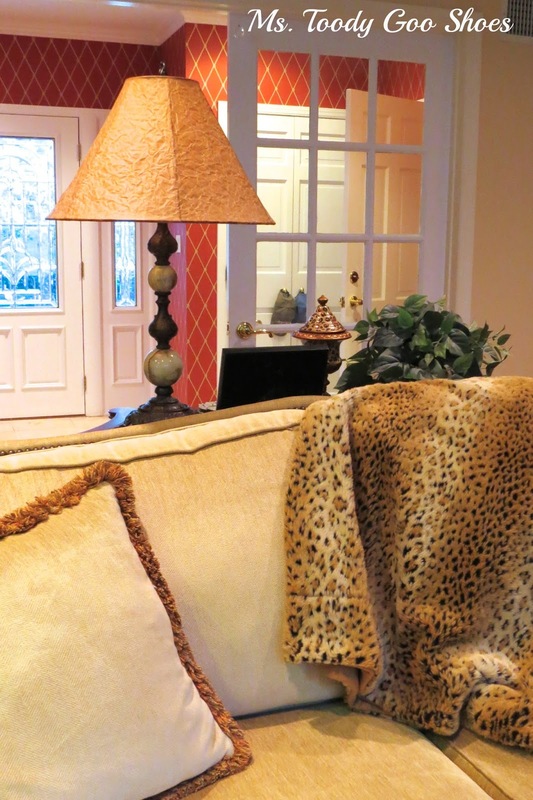 We have a faux animal throw almost just like the one you show above. My hubby wraps up in that thing every night. Alright y'all I sure hope you will take the time to go over to Amy's and tour some more of her home and say hello. Miss any past favorite room posts? You can see them all right here. Thanks again, Kim, for inviting me to invite my favorite room! It was a lot of fun! I love Amy's family room! 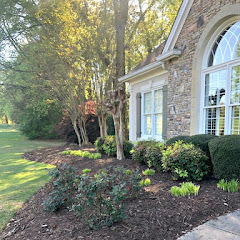 It looks like a wonderful place to hang out with friends and family. Very warm and inviting. I like the way Amy divided up her room into two separate areas. It makes it cozier. The sky lights make the room so interesting! Good story. 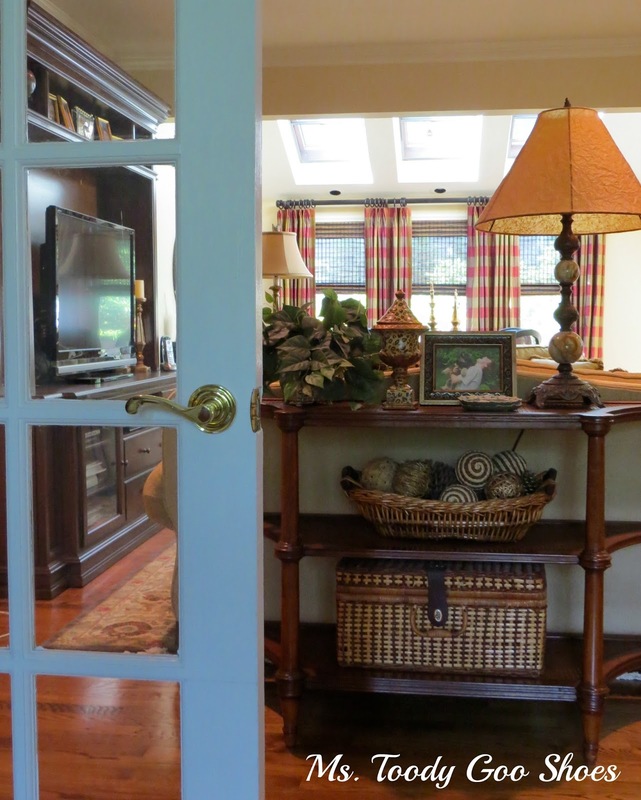 Amy's home is so beautiful as well as warm and inviting! 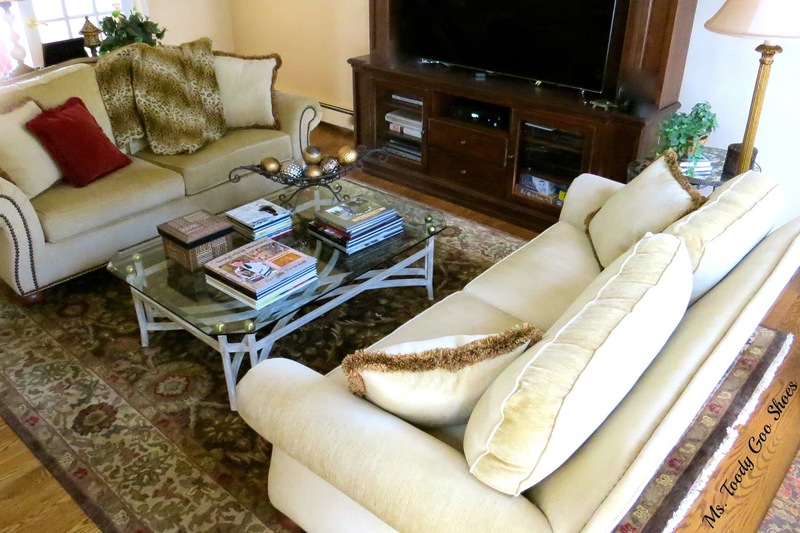 Her family room is the perfect gathering room for family and friends. What a great room! I especially love those skylights. I'm am getting all sorts of ideas looking at your room. I would have never expected Orange Children's Motrin to come out of that fabric. Good thing it's stain resistant! Now I want it. What a wonderful room filled with so many beautiful details yet so functional for the needs of an active family…I love the sofas!…the room seems to be filled with so much great light..and had to laugh at what her son said! !…I have the very same silver lighter that was my hubby's parents…A great feature and choice today Kim..as Amy's room is outstanding! !…Have a great weekend! 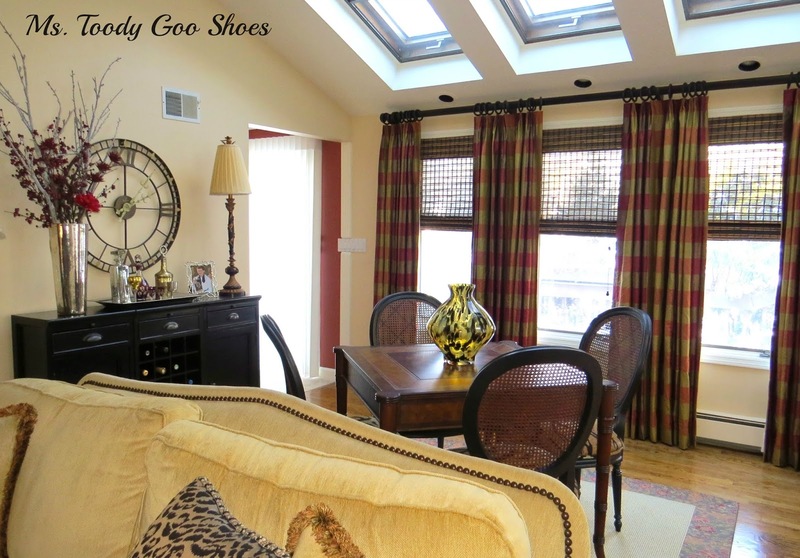 No wonder you fell in love with this house...what a great layout... and the windows are amazing! 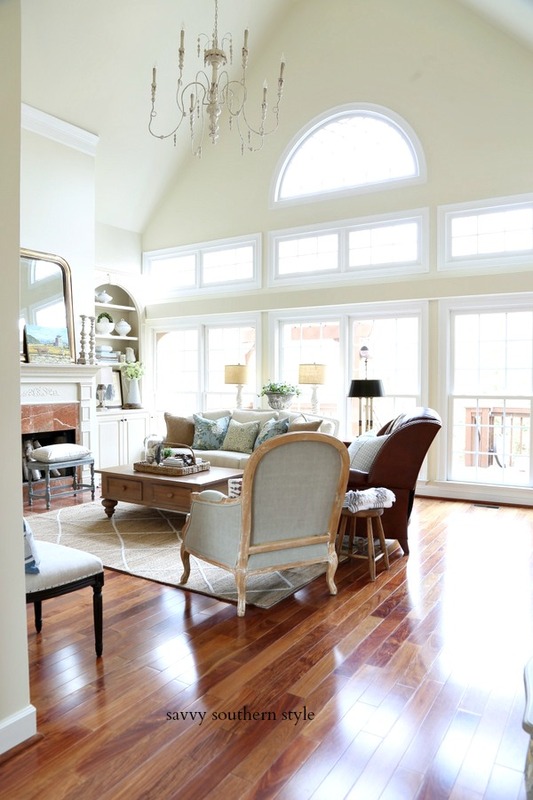 You style is so warm and inviting and you home filled with so many great inspiring ideas! I adore the game table. You would find my family there! 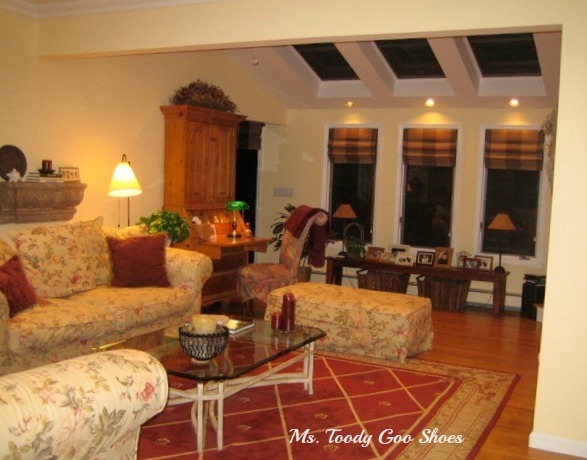 Amy, Thanks for sharing your favorite room... it's really amazing! And thanks Kim, Amy's blog is new to me and I'm so glad you introduced her to us! 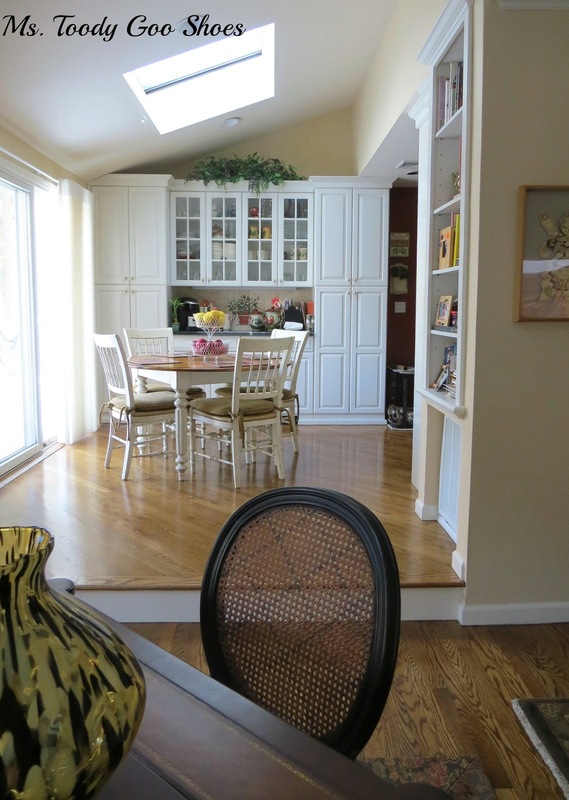 Wow, open floor plan, skylights, and so much space. I love how fresh this feels. Thanks for all the beautiful eye candy. I love your blog name, too. "except when I am doing the dishes while Mr. Goo Shoes is trying to watch TV. I am signing up for silent dish-washing classes very soon ;)"
Beautiful! I love the warmth and welcoming feel this room offers. What a lovely surprise to see Amy's beautiful home featured here today! 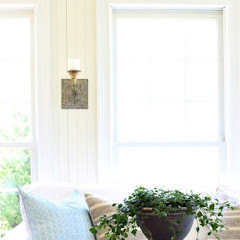 I love the layout and the light in this space, and Amy has done such a wonderful job of furnishing and decorating it in such a cozy and comforting style. 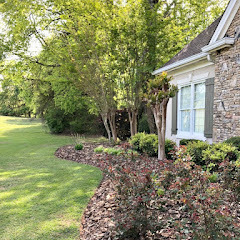 It truly is a room that invites family and friends for fun, or quieter moments, lingering on those great loveseats, looking at beautiful family memories! What a great room and everything is perfect. So nice to be able to see your guests when you are in the kitchen. Thanks so much for sharing your lovely room. 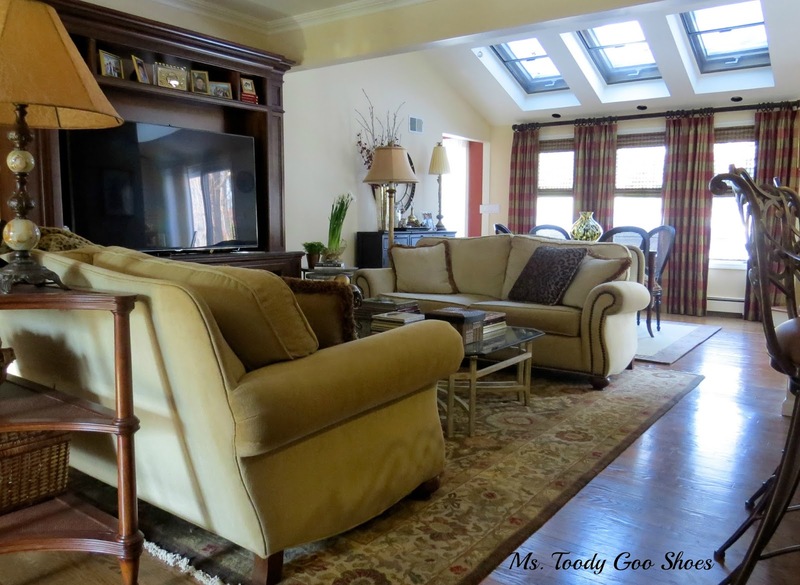 Oh Miss Amy is fabulous and I love her home and her favorite cozy room! What a fantastic favourite room! Warm and cozy. Luv the facing luv seats. Thanks for sharing ladies. What a gorgeous room. Very cozy and I love the windows and the natural light that comes in those windows. Very pretty room. That is a charming room. I especially like the animal print chairs and drapes. This is beautiful! Your home feels just like a... home! And that is the best feeling you can have when entering a room. It's just right! PS: I just came here to thank you for your "pins" from my blog, Kim. I was so happy to see you there the other day! :-) Big hugs and a very Blessed 2014! I have always loved seating facing each other like yours is. So cozy. And I love the openness of the layout. Great room! 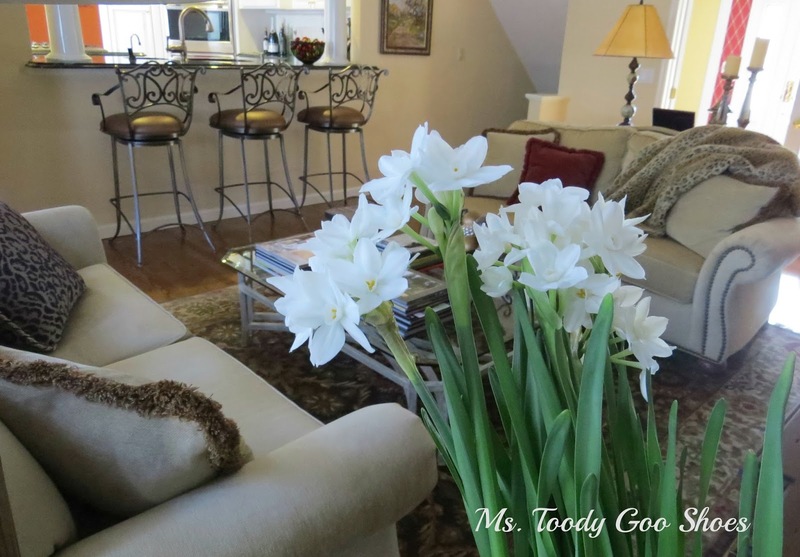 Amy, You have a wonderful sense of style, both rooms are beautiful the before and after! I love Miss Toody and Miss Toody's house! 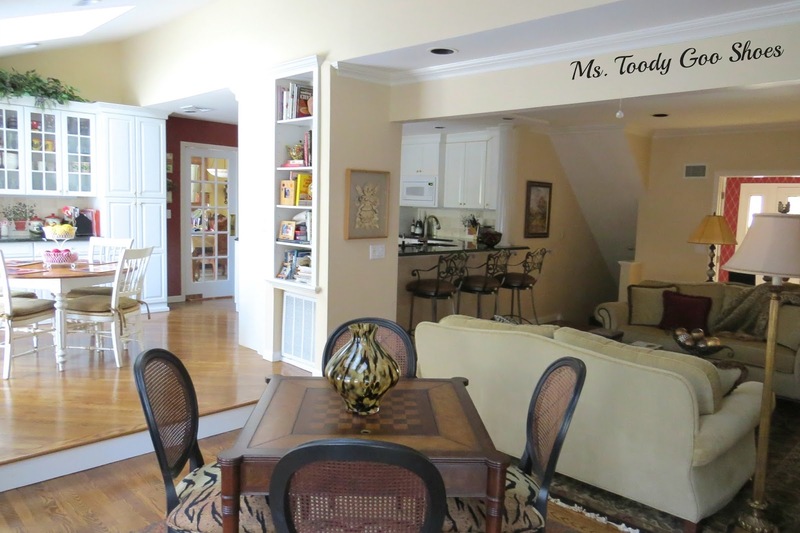 That family room is so cosy and it's so nice to be able to see from there her kitchen where she makes so many wonderful recipes! So beautiful! I love all the details and your home itself is beautiful!! I love Amy. Her home is gorgeous and so is this room. Her son's comment is hilarious. Amy's home is beautiful! 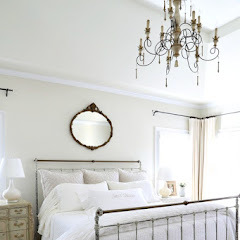 I really enjoy reading these weekly my favorite rooms.I have not seen her blog before so it was a treat discovering a new blog! Hi Susan, the floral furniture in the "before" picture is from Domain, which, sadly, is no longer in business. Thank you, everyone, for all of the wonderful comments! You made my day! Amy your house is gorgeous! The first thing that caught my eye is that you angle your tables - I love that because it adds another element to the room. 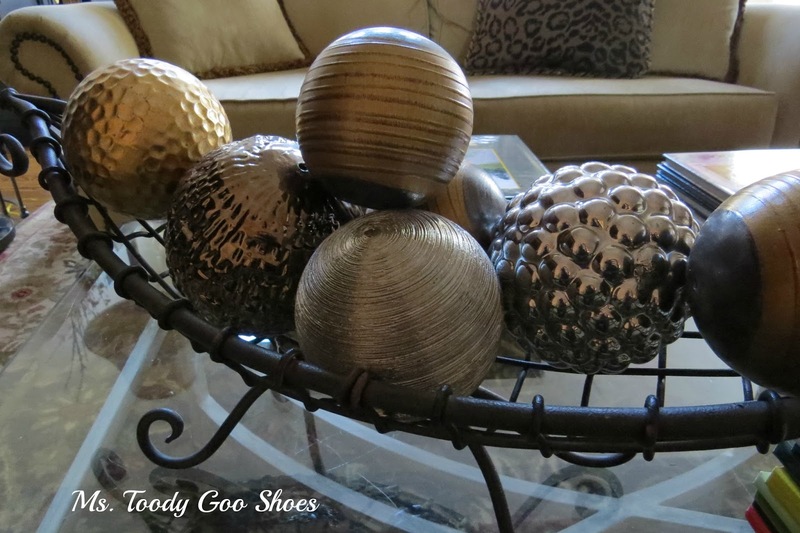 I also noticed you, like me, collect decorative balls and place them in baskets and bowls throughout your house. I'm known as "the ball lady"! 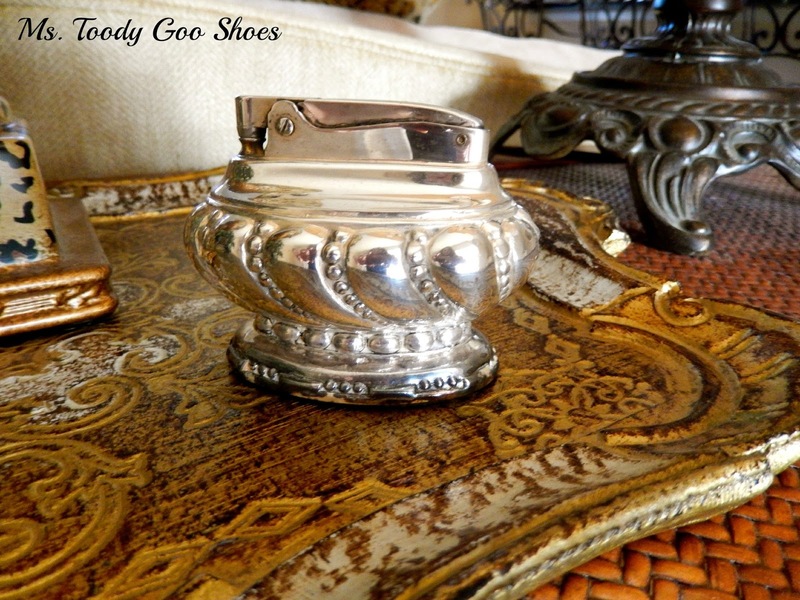 Love your mercury glass collection too. 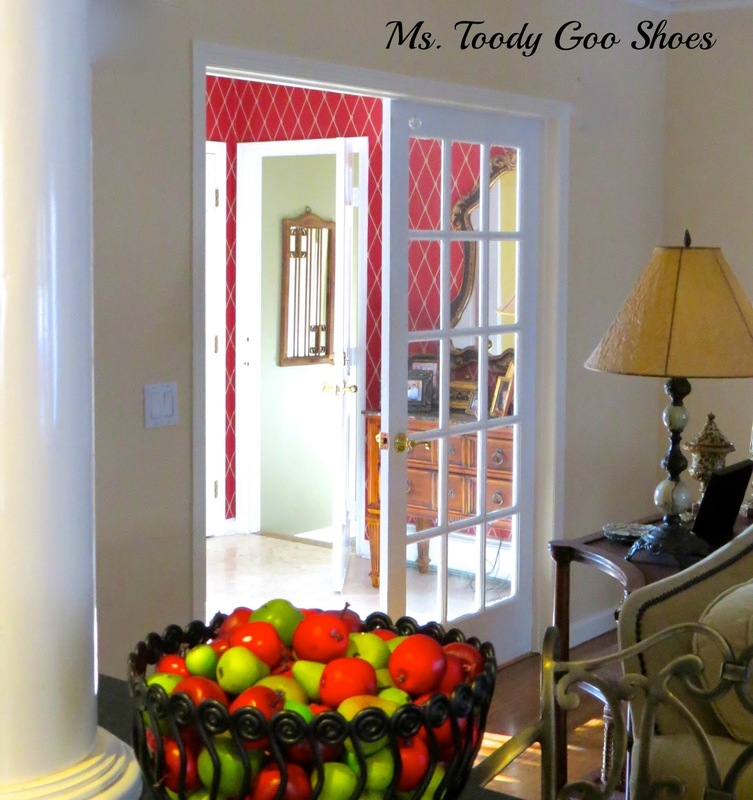 Is that beautiful red wall stenciled or wallpaper? Love your taste in decorating! Thank you Kim for sharing Amy with us. She is definitely a MUST follow!